Cristina now hurricane. 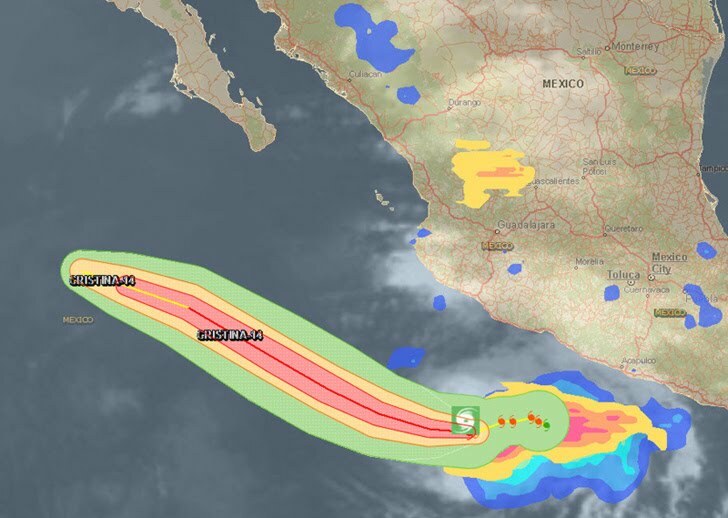 At 02:00 hr PDT the center of Hurricane Cristina was 425 km/265 mi S of Manzanillo Mexico. Cristina is moving toward the west near 9 km/h. A turn toward the west-northwest with a slight increase in forward speed is expected during the next couple of days. Maximum sustained winds have increased to near 120 km/h - 75 mph with higher gusts. Additional strengthening is expected during the next 48 hours. Swells generated by Cristina are affecting portions of the south-central and southwestern coast of Mexico.